With shimmering blue waters, scorching summer temperatures and sand so delicate your feet sink with every stride, holidays in Greece offer pure beach bliss. Home to roughly 8,000 miles of coastline, you certainly won’t run out of sunbathing spots. On top of that, this sand-filled country has an impressive 227 inhabited islands, so every beach-goer is catered for. From Crete’s Caribbean-like sands to party coastlines in Mykonos and Corfu’s secluded coves, here are the best beaches in Greece. Location: Situated in southwestern Crete, this peninsula is fairly remote with most travelling here by car from Chania, which is around an hour and a half away. Why visit: This Instagram-worthy shore has been ranked among the world’s top 25 beaches on TripAdvisor, which is a testament to its natural beauty. Wondering what makes this coastline stand out? 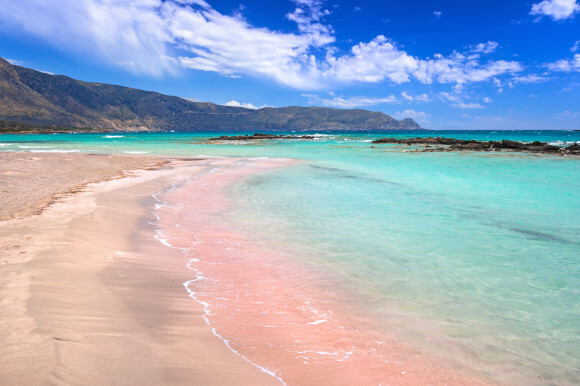 Just wait until you step on its pink-tinted sands and look out over those gentle emerald ripples. Often compared to the Caribbean for its exotic good looks, this protected area is one for the bucket list. Despite being separated from the mainland, it’s easily accessible. Simply wade through its shallow waters until you reach a small inhabited island – pretty cool, right? Best for: Families, couples, swimming, windsurfing and taking photos. 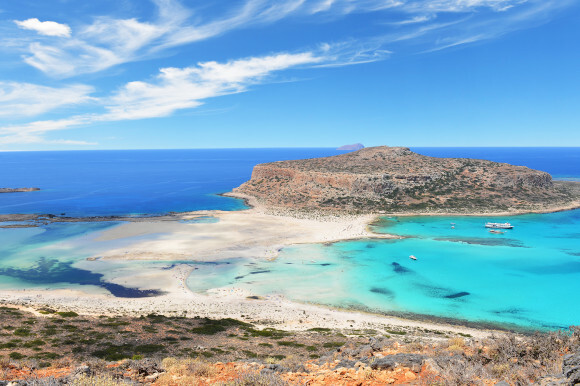 How to get here: The most common way to get here is driving from Crete’s bigger towns or hopping on a bus from Chania. This stunning shore also features on a number of coach tours if you’d prefer to book an organised trip. Top tip: Come prepared, especially if you’re travelling with small children. With few amenities on hand, it’s always a good idea to pack the essentials. Location: Situated in the picturesque resort of Paleokastritsa, this eye-catching stretch can be found on the northeast coast of Corfu. Why visit: As Paleokastritsa’s central and most popular shore with a desirable position underneath the resort’s beautiful monastery, Agios Spyridon is a real crowd-pleaser when it comes to beach days. Celebrated for its spectacular scenery, in which you’ll find the Albanian mountains, this is the perfect spot to take in your surroundings as you soak up Greece’s toasty rays. Though its views aren’t the only draw, this beach is also the resort’s largest. The right end tends to be the busiest with water taxis at your disposal, while the left side is the place to relax. Should you want to discover what lies beneath the ocean’s surface, snorkelling adventures come highly recommended here. Best for: Families, snorkeling, scuba diving and pedalo hire. How to get here: If you’re not staying in Paleokastritsa, it’s extremely easy to get to Agios Spyridon. You can either travel by car and use the shore’s convenient car park or catch a bus. 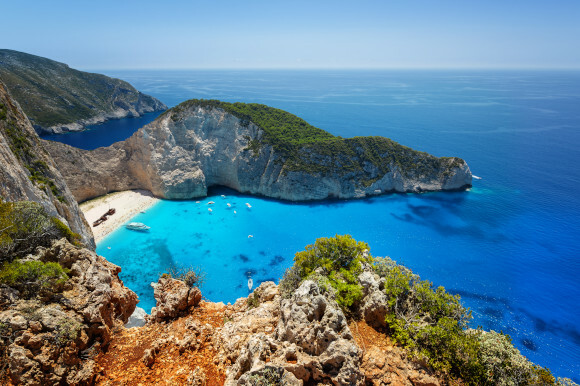 Location: This miniature cove is situated on Zante’s northwestern coast. Why visit: This is arguably one of Greece’s most famous beaches, if not the most! There’s something about a slither of white sand surrounded by the bluest waters and towering cliff sides that excites your inner wanderlust. Adding to its appeal, is the fact it’s only accessible by boat. And if that wasn’t impressive enough, the shore didn’t acquire the nickname ‘Shipwreck Beach’ for no reason. This stand-out stretch is home to a stranded boat, which has been there since the 1980s. For those wanting to recreate those famous aerial shots, you’ll need to head to the spot’s viewing platform – this can be reached from the road. Best for: Families, taking photos and swimming. 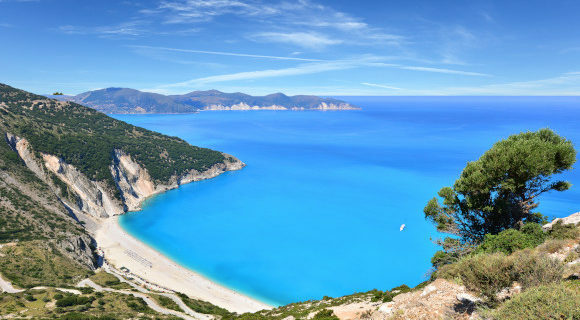 How to get here: As one of Zante’s must-see attractions, boat trips come here from all over the island. However, the harbour Porto Vromi and Zante Town tend to be the most popular choices. Top tip: As one of Greece’s most commercial spots, we suggest heading here early to avoid its biggest crowds. Want the beach all to yourself? This may be possible during off season, but still not guaranteed. Location: This upbeat seafront is just a 20-minute drive from Mykonos Town. Why visit: Paradise Beach is one of Mykonos’ most well-known spots, and offers a sand experience unlike any other. Although not suited to everyone, this lively shore knows how to get the party started with a mix of surrounding bars and plush sunloungers for hire. There is a clear distinction between mornings and afternoons along the white sands of Paradise Beach. Those wanting to relax should head here early, while keen partiers should hit the shore around 4pm when the music is at its loudest. Best for: Beach parties, eating options, swimming and snorkelling. 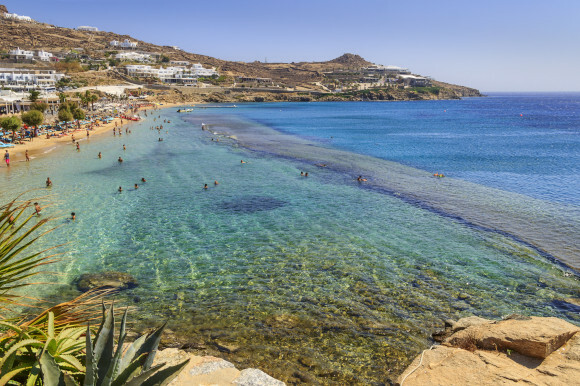 How to get here: From Mykonos Town, you can either travel by car using the signposts from Chora and park at the Tropicana Beach Bar, or you can catch one of the hourly buses. Did you know? 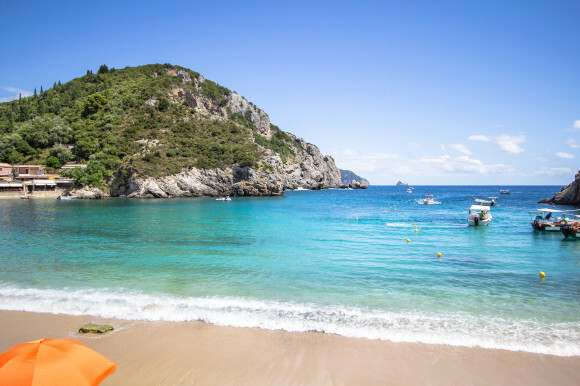 The beach is also home to a diving school, so when you’re not dancing on the sand, beginners and experts alike can hire equipment and make use of qualified instructors. Location: Wedged between the resorts of Assos and Argostoli on the island of Kefalonia, this shore can be easily reached. 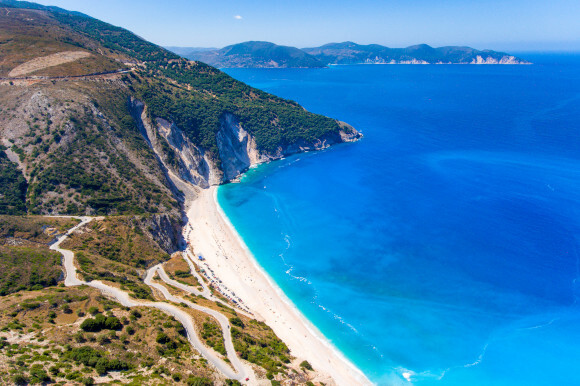 Why visit: There’s one place most of us think of when we envision Kefalonia, and that’s the dramatic coastline of Myrtos Beach. Catching the attention of beach-goers all over the world with its white cliffs and even whiter sand, the views are out of this world. And with an absence of watersports, you can admire your surroundings in silence. For a truly special experience, head to the famous viewpoint at sunset and witness one of the most magical backdrops. There’s something about those last rays of daylight bouncing off Myrtos’ steep cliffs that will stay with you forever. Best for: Sun-worshippers and nature lovers. How to get here: This beach is best accessed from the road, either by car or bus, however it won’t take you directly to the shore. To get to the sand, you’ll have to take the 335 steps down. Did you know? This beach had its 15 minutes of fame when it featured in the Hollywood blockbuster, Captain Corelli’s Mandolin. Location: Perissa is around a 30-minute drive from the the island’s capital, Fira. 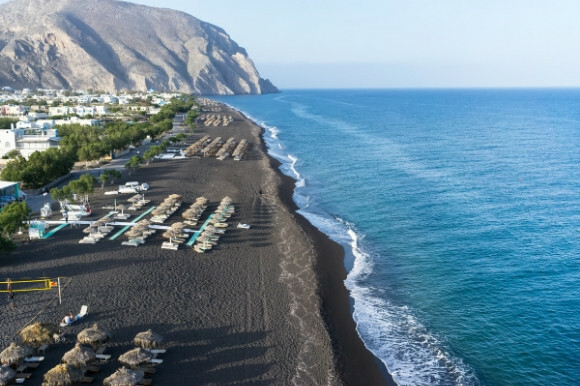 Why visit: This black sand and pebbled combination makes for a one-of-a-kind beach experience. From its darkened sands to its rock formations, there’s no escaping its volcanic origins. And at a staggering seven kilometres long, there’s no wonder it pulls in the crowds. What’s more, there’s not alot you won’t find here. 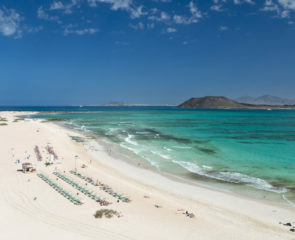 The shore is packed with amenities, whether you’re looking to hire a sunlounger, want to grab something to eat or test out the many water-based activities on offer. Best for: Families, watersports, swimming and eating options. How to get here: If you’re not staying in Perissa, this beach is best accessed via the road, whether you choose to hire a car, or take advantage of the many buses from Fira. Top tip: The pebbles on this beach can be a little challenging on foot due to their slippery and uneven surface. Therefore, it may be a good idea to invest in some sea shoes. Location: You’ll find this beautiful shore in the island of Skiathos, along its northeastern coast. Why visit: No photo does this shore justice, Lalaria’s beauty has to be seen to be believed. Limestone cliffs sitting upright in the sea and white pebbles gleaming in the sun – you’ve arrived in paradise. But there’s one rock which stands out from the rest. 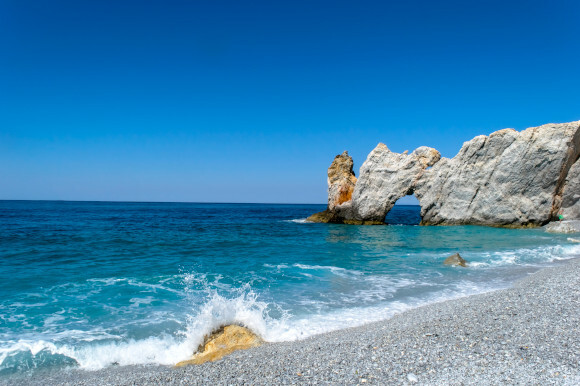 On the west side of the beach you’ll find a natural arch, which is associated with ancient Greek mythology. It’s said those who swim under it instantly become younger. Make sure you come prepared as snack options and sunloungers are nowhere to be seen. For those wanting to escape the sun, the shore comes with plenty of natural shade thanks to its rocky backdrop . When it comes to adventure, Lalaria’s emerald waters are ideal for snorkelling expeditions – just make sure you bring your own equipment. 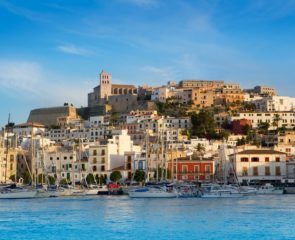 How to get here: This pebbled stunner is only accessible via the sea, so you’ll need to catch a boat if you want to visit. The old port in Skiathos is your best bet with a number of day trips stopping at Lalaria Beach. Top tip: Strong northerly winds can often stop the boats from sailing, so we always advise checking the weather before booking your trip. Location: St. Paul’s Bay sits on the island of Rhodes in the popular resort of Lindos, just minutes away from the centre. Why visit: This idyllic cove is one of the island’s most popular sunbathing spots. Enjoy views of Lindos’ ancient acropolis as you swim in its warm, turquoise shallows. You’ll also notice that the bay is enclosed by rocks, this means it is a fantastic spot for snorkelling – which sea creature will you spot first? This stunning shore is also home to traditional whitewashed chapel, with people coming from all over the world to tie the knot. If you’re lucky, you may even get to witness a wedding from the sand. You’re well catered for too. St Paul’s Bay makes up for its lack of watersports through its fantastic amenities with a good choice sunloungers, toilets and a handy taverna, serving up a choice of drinks and a delicious selection of Greek plates. Best for: Couples, swimming and snorkelling. How to get here: St Paul’s Bay is easily reached. Those staying in Lindos can walk from the centre, while those travelling from further afield can hop on bus or drive and park in the car park at the top of the cove. Did you know? The bay’s name comes from its long history, after St. Paul himself visited in 51 AD. Location: Situated on Crete’s northwestern coast, near the town Kissamos. Why visit: This beach is so beautiful it looks like it has been photoshopped. There is nowhere else on the island quite like it, in terms of natural beauty that is. When you first arrive, it’s hard to believe you’re in Greece. Pink-tinted white sands surrounded by exotic blue waters and towering sea cliffs, there’s no wonder it’s one the country’s most visited beaches. Despite the large groups of tourists, the spot’s spectacular scenery and nature reserve location comes with a feeling of isolation, almost like you’ve reached a remote desert island away from any signs of civilisation. Apart from a lonely taverna, the beach has few amenities, so we suggest you come prepared. If you want to see Balos’ beauty from up high, it takes some dedication. By that we mean walking 45 minutes to and from the road at the top. Remember – the earlier you arrive, the better your photos will be. Best for: Couples, relaxing, swimming, taking photos. How to get here: You can reach Balos Lagoon one of two ways. These are either – hopping on a boat from Kissamos or Chania, or accessing it by road. If you choose to drive, follow the signs to Kissamos and then to the village of Kalivani, and you’re on your way. Please note, part of the journey is on a dirt road, so you’ll have to drive extremely slow. When you finally get to the car park, you’ll need to walk a further 20 minutes to reach the lagoon. Top tip: Want to experience the lagoon’s beauty without worrying about schedules and tons of crowds? Then we suggest hiring a car. Most trips get extremely busy and only offer limited time at Balos, so if want to arrive and leave as you wish, this is the best option. 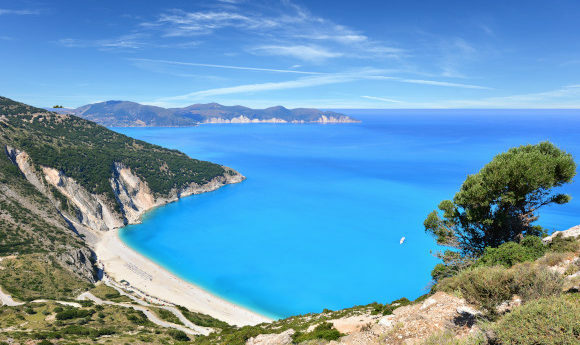 After admiring these stand-out shorelines from afar, come and experience Greece’s best beaches for yourself. In love with the idea of travel, Adele likes to flit between city breaks and beach escapes. Travelling as far as Mexico for some winter sun, she is always looking for her next adventure. From witnessing the Northern Lights in Iceland to exploring ancient relics in Rhodes and partying in Ibiza - her getaways are pretty diverse. Conquering one country at a time, Adele has visited over 50 destinations.